This town is just bursting with history. It is at once a singular history of American immigration, but also a million separate stories of ingenuity and persistence. A couple of weeks ago, we mentioned some upgrades in the works for the Hamtramck Historical Museum. But the HHM isn’t the only museum with things percolating. There is also plenty afoot with the city’s Ukrainian American Archives and Museum. Founded in 1958, originally in a former bank building on Woodward, the now-relocated Ukrainian Museum had become a long-time landmark at the southeast intersection of Charest and Commor. A recent move now places them very near the Hamtramck Historical Museum on Jos. Campau. The address will be 9630 Jos. Campau, on the east side of the street in what used to the Fashion Kraze clothing store between Edwin and Norwalk. The Hamtramck Historical Museum is just a block farther south, on the west side. Also in this now-burgeoning cultural center area can be found the Polish Art Center and Tekla Vintage store. The Ukrainian Museum has a grand opening planned for this Saturday, Nov. 11, from 4 until 7 p.m., that will include a ribbon cutting ceremony at 5 p.m. The following day, Sunday, Nov. 12, there will be an open house from 10 a.m. until 3 p.m. Featured both days will be an ongoing sale by Ukrainian artists. The museum has, per its website, hosted some other fairly significant exhibits in the past, including ones on ritual cloth, headdresses and decorated Easter eggs. They have also hosted a youth symposium. We asked museum representative Nadia Juzych to answer a few questions for us. Review: Thanks for agreeing to answer a few short questions. Looking at your website, it says there’s been a Ukrainian museum at one location or another in Hamtramck since 1958. That, of course, would’ve been while the Ukraine was solidly a part of the Soviet Union. 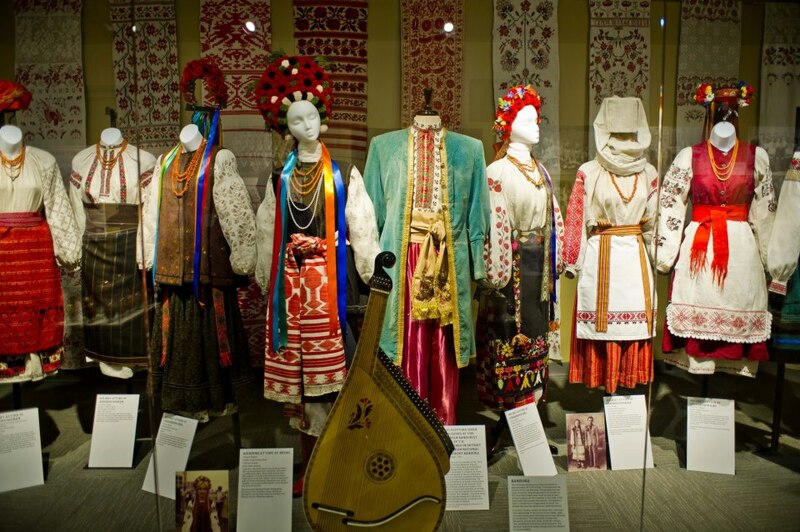 Can you expound upon the importance to the community here in the U.S. of having a museum specifically for Ukrainian culture, even as the country was absorbed for a long time into the larger whole of the U.S.S.R.? Juzych: Ukraine always has and always will be a separate nation, with its own distinct culture, language and customs. As a “captive nation” under the Soviet Union, it became increasingly important for exiled Ukrainians to preserve and cultivate their identity, as Ukrainian culture and language were brutally suppressed during Soviet rule. The arts were especially targeted. Despite being occupied through much of its history, Ukraine’s identity remains as strong as ever. On August 24, Ukraine celebrated year 26 of its regained independence. Since that time, many new immigrants have relocated to the Detroit area, and now reside in Hamtramck. The Ukrainian-American Archives and Museum serves a vital role not only for the Ukrainian community, but for the community at large, by showcasing its unique culture and enduring spirit, and passing this down to future generations. Review: The museum’s website’s mission statement mentions, in part: research; the preservation of documents and artifacts; and so forth. Can you give examples of some of the museum’s more interesting items in its collection? Juzych: Firstly, the archives and photos of Dr. Mary Beck, the first female president of the Detroit City Council. She was the first Ukrainian American to serve in this capacity, and she also served as the acting mayor of the city of Detroit from 1958-1962. We even have her chair and gavel, some of her telegrams, etc. There are oral histories of Auschwitz survivors, the World War II archive of Krochmaluk, and original photos from the 1986 Chornobyl nuclear disaster. The museum has a rare document signed by Metropolitan Andrei Sheptysky, a candidate for sainthood. There is a death mask of Taras Shevchenko’s face (Ukraine’s most famous poet and artist), and a document authenticating it. We also have his multi-volume book of poems, “Kobzar” (meaning “The Bard”), and photos of his paintings. Shevchenko lived from 1814-61, and his life journey was extraordinary — from serfdom, to exile, to international acclaim. The Kobzar is very important to Ukrainians, as it played an important role in both galvanizing Ukrainian identity and in developing Ukrainian literature. When the book was first published, it was censored by the Russian czar. Every Ukrainian child grows up reciting Shevchenko’s poems. The museum also houses film reels and vintage photos of immigration events, organizations, schools, churches, concerts, performances, etc. There are some 25,000 books for research and reading. Also, there is an embroidered Bukovyna “dodilna sorochka” (blouse) from 1910, donated by Anastasia Demian. Bukovyna is a region in southwest Ukraine near the Carpathian Mountains. Review: Mr. George Stasiw is your current board president. Anything interesting or pertinent in his past, or for that matter, for any of the others currently (or formerly) connected to the museum? Juzych: George Stasiw was born and raised in Detroit to Ukrainian post-war immigrant parents, who raised George and his five siblings with both a strong foundation in, and a love for, Ukrainian history, art, food and music. George’s father, Peter Stasiw, was principal of Immaculate Conception High School in Hamtramck, on Hanley St., for over 25 years. Peter dedicated his life to preserving Ukrainian heritage through education, and his youngest son George continues his legacy through his own very active involvement in the Ukrainian community. In his role as a musician, George — along with his twin brother Andrew — had an opportunity to represent the United States in a Ukrainian Music Festival in Chernivts back in 1989. This was during the Soviet era, and George and Andrew’s band was the first to publicly perform the Ukrainian National Anthem in their homeland in over 35 years. This was considered to be a very bold move at the time, as independence was considered equivalent to treason. Andrew is also very active in New York City, where he lives; he is the principal of St. George’s Ukrainian Academy, a college preparatory high school. This is the only Ukrainian Catholic High School left in the United States. Review: As regards the new building and its grand opening: Why was it deemed necessary to get into a new facility? How did you come to choose your new location? Did it have anything to do with being near the Hamtramck Historical Museum, or was that just chance? Juzych: The Board of Trustees had been searching for a location for a new museum building for several years, as we long ago had outgrown the 1,400-square-foot facility on Charest in Hamtramck. The new museum has more than 13,500 square feet! The museum has a large collection of paintings, costumes, artifacts, historical archives, and about 25,000 books that had been previously kept in storage, in both basements and a warehouse, for many years. Locations across southeast Michigan were initially considered for the new location, but we recognized the value in returning to our roots in Hamtramck. A thriving Ukrainian community still lives in the city, and we see Hamtramck experiencing transformative times. We believe the city serves as an active cultural hub, and is a wonderful location from which to promote ethnic diversity in the greater Detroit area. The new location of the Ukrainian American Archives and Museum is now ideally located on Joseph Campau, across from the Hamtramck Historical Museum, down the street from the Polish Art Center, two doors from Tekla Vintage and near many other wonderful neighbors. We have already had the opportunity to collaborate with the Historical Museum, and look forward to many more such collaborations with our neighbors in the future. Review: Is the museum a 501(c)3 non-profit, or something else? Juzych: The museum is a tax-exempt 501(c)3.
Review: Anything you want to add about the artists? Juzych: We have a wonderful display of Ukrainian art and historical artifacts, as well as a diverse array of artistic works from Michigan Ukrainian artists in the main gallery. Our smaller gallery will serve as a gift shop containing a variety of artwork that will be for sale, and includes hand-painted silk scarves, jewelry, paintings, ceramics and books by Michigan Ukrainian authors. Review: Is your normal visitors pricing structure in place for the opening, or is it free for both days (or just one or the other)? Juzych: There will be no charge to enter the museum during the Grand Opening Weekend, Nov. 11-12. Beginning Nov. 13, museum entry, while still free for members, becomes $3 for non-members. Membership sign up will be available during the Grand Opening, though, and donations are also always appreciated. Learn more about the museum from its website, ukrainianmuseumdetroit.org or from its Facebook page, www.facebook.com/UAAMDetroit. The phone number is (313) 366-9764. Looking forward to the opening tomorrow.